[Tokyo Disney Resort] Programme complet du divertissement à Tokyo Disneyland et Tokyo DisneySea du 15 avril 2018 au 25 mars 2019. The Easter event returns after a two-year hiatus with a new look. The setting for this whimsical Easter-themed event is the secret ―Easter garden‖ that Mickey Mouse and Minnie Mouse have discovered. In addition to a new parade, there’s an egg hunt program to find the eggs hidden by the bunnies and photo locations featuring the bunnies coloring and handling the Easter eggs. 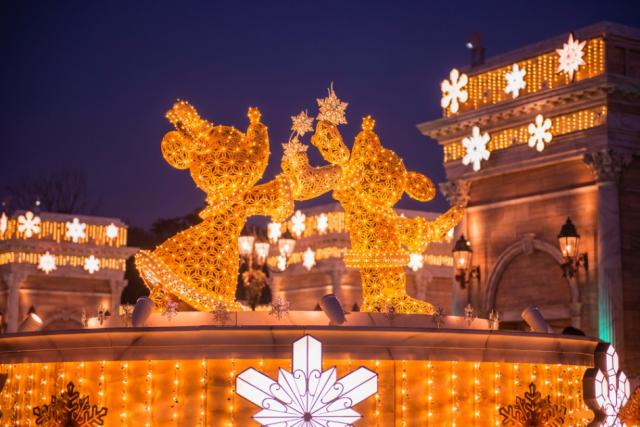 Guests are sure to enjoy this Tokyo Disneyland-style Easter. Mickey Mouse and Duffy, the popular bear at Tokyo DisneySea, take Minnie Mouse and ShellieMay, Duffy’s friend, on a happy voyage to show them what springtime is like around the world. Dressed in new costumes, Mickey Mouse and his friends travel to different ports. 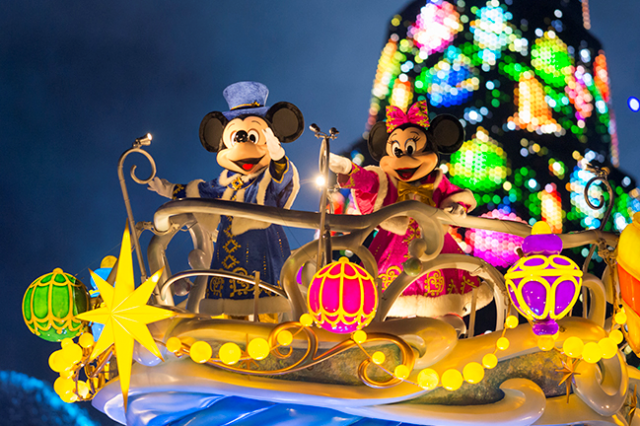 They experience an Italian spring festival, an Easter celebration in New York and a magical spring in Arabian Coast. This fantastic and heartwarming nighttime entertainment using projection mapping technology premieres on this date. The show begins with Mrs. Potts from the Disney classic film Beauty and the Beast begins telling her son, Chip, a bedtime story. As the story unfolds, unforgettable scenes from Disney films are recreated through 3D images, moving Disney music, on-stage pyrotechnics and other special effects. Rich and full of wonder, this new entertainment transforms Cinderella Castle into a veritable ―storybook come to life. 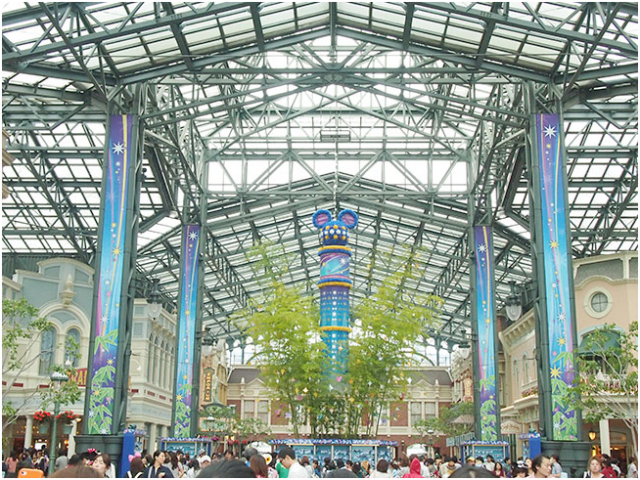 The Japanese star festival known as ―Tanabata‖ is celebrated at Tokyo Disneyland with traditional decorations in World Bazaar. Guests can write their wishes on ―Wishing Cards‖ to be hung from the grand centerpiece. 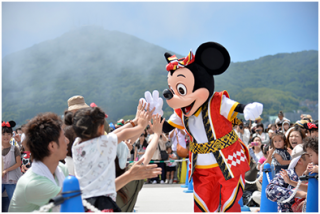 Mickey Mouse and Minnie Mouse, dressed in new costumes as Hikoboshi and Orihime, the two star-crossed lovers of this festival, will greet Guests along the parade route. 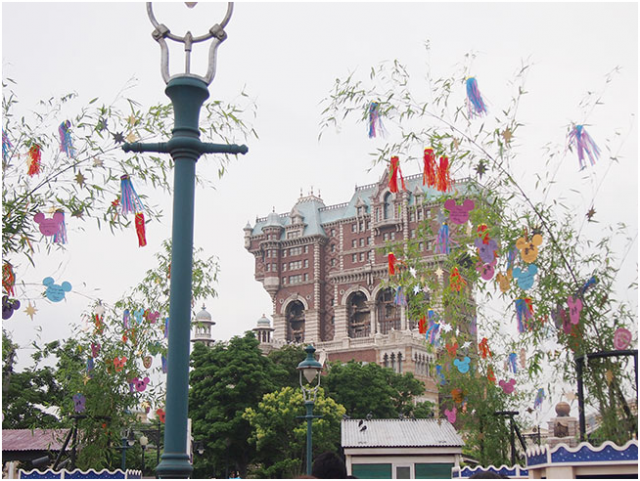 Tokyo DisneySea will present a ―Tanabata‖ program for the first time. 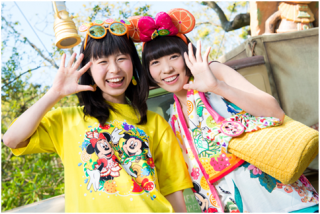 Dressed as Hikoboshi and Orihime, the festival’s two star-crossed lovers, Mickey Mouse and Minnie Mouse will appear in a greeting show in Mediterranean Harbor. 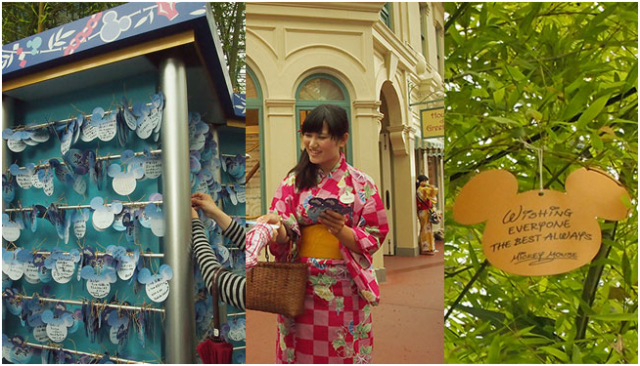 Guests will find traditional Tanabata decorations in the New York area of American Waterfront where they can also write their wishes on a card and hang them on the ―wishing place.‖ Guests can enjoy Tanabata in a unique Tokyo DisneySea style. 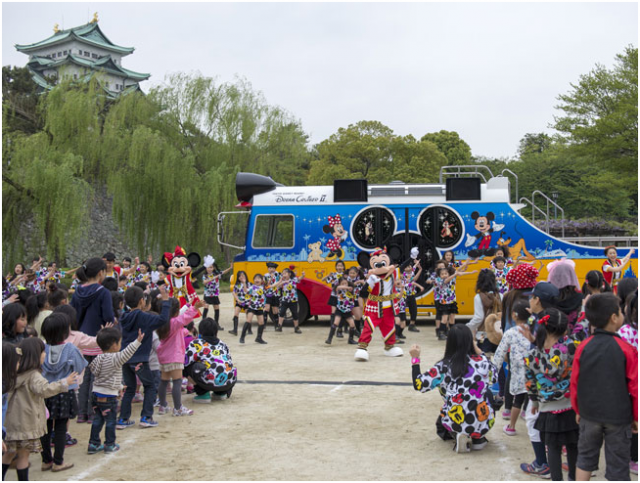 Natsu matsuri means ―summer festival‖ in Japanese, and again in 2014 the Park will offer an energetic event just for the hot summertime. Decked out with Japanese banners and lanterns, the Plaza in front of Cinderella Castle will have shops selling festival goods, cold drinks and other items that add to the festive atmosphere. 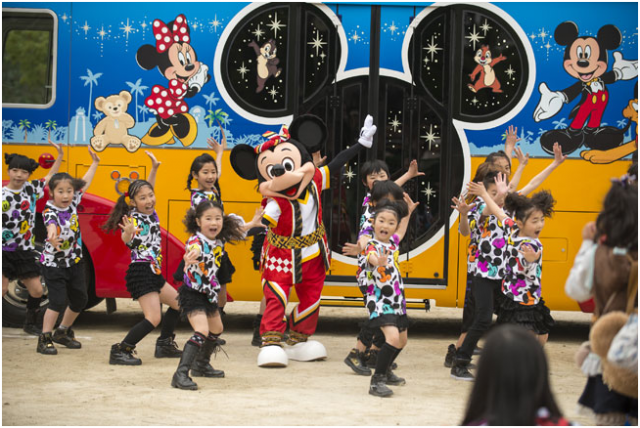 Children and adults will all get soaking wet as they enjoy a new show featuring the Disney characters in a Japanese-style festival. 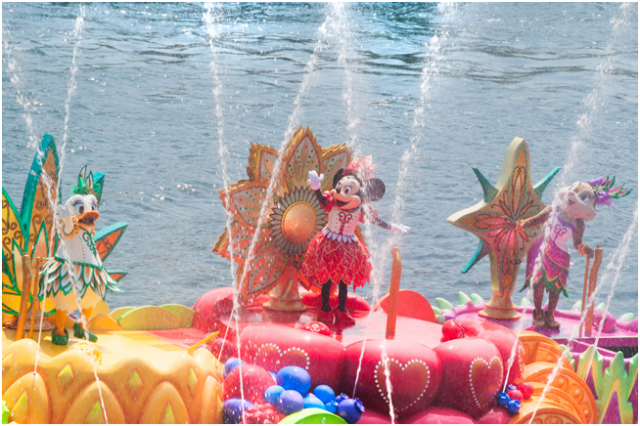 Minnie Mouse is the star of this ―hot‖ but ―cool‖ summer festival that was first presented in 2013. The main venue is Mediterranean Harbor which will be transformed with banners in vivid colors and juicy tropical fruit decorations for a cheerful and bright summer mood. 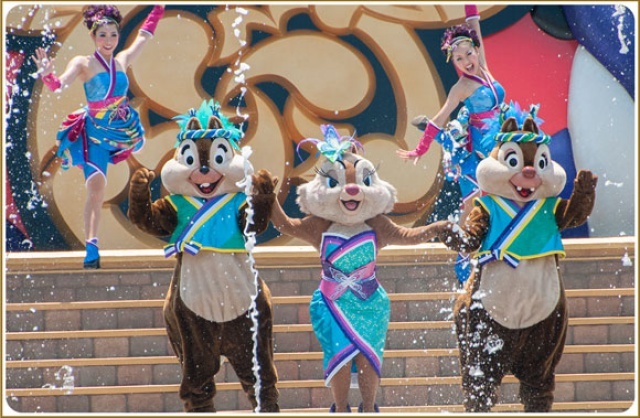 The main show, with its rhythmic music, lets Guests enjoy the summer with the Disney friends as everyone gets soaking wet. This popular Adventureland attraction takes Guests on an exciting cruise through the jungles with a humorous skipper at the helm. The renovated Jungle Cruise will have new scenes, new lighting effects and other special show effects, as well as an after-dark only ―night cruise.‖ Guests can look forward to an even more thrilling jungle adventure when they experience the revamped attraction. Note: The attraction will be closed from January 6, 2014 for this renovation work. Again in 2014, each Park will offer in its own way a Disney’s Halloween event filled with an autumn mood. 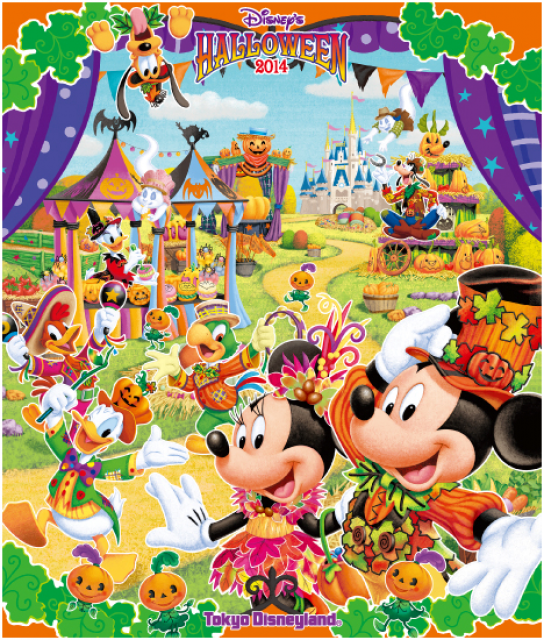 At Tokyo Disneyland, the Disney characters will be joined by the Halloween ghosts for a happy Halloween fair. The venue will be full of pumpkins that have expressive personalities, making the Halloween atmosphere even more fun. 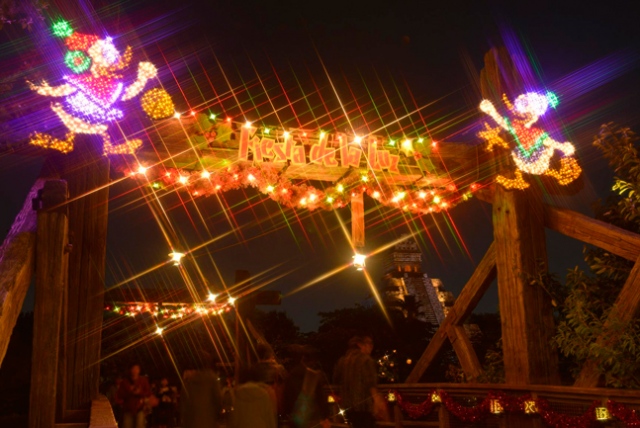 And at Tokyo DisneySea, the Disney characters and their skeleton friends will present a gorgeous Halloween carnival. 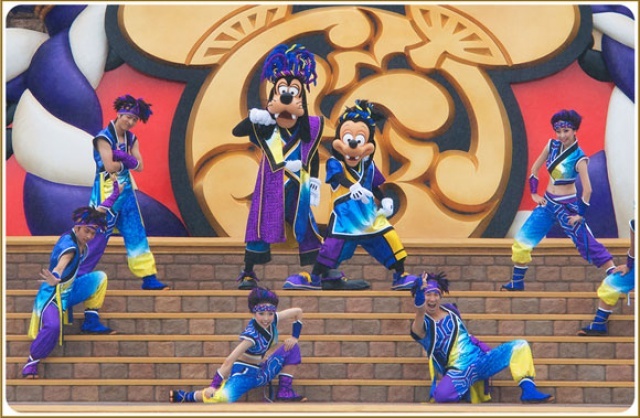 Again in 2014, the humorous skeletons will play a big part in enlivening the scary, but fun Halloween at Tokyo DisneySea. 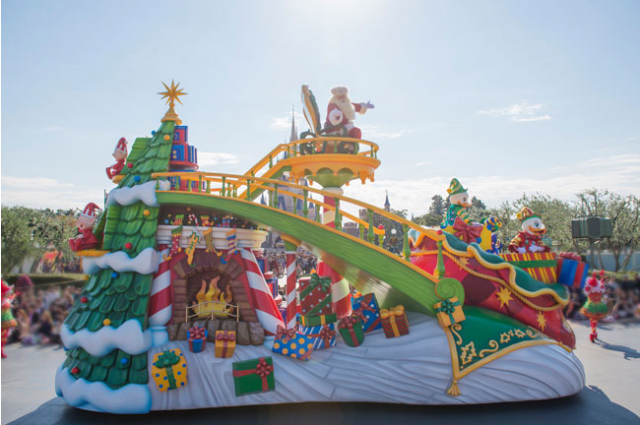 Set in Disney’s Santa Village where Santa Claus and his elves are busy getting ready for Christmas, this event is filled with the fun and fantasy of the season. 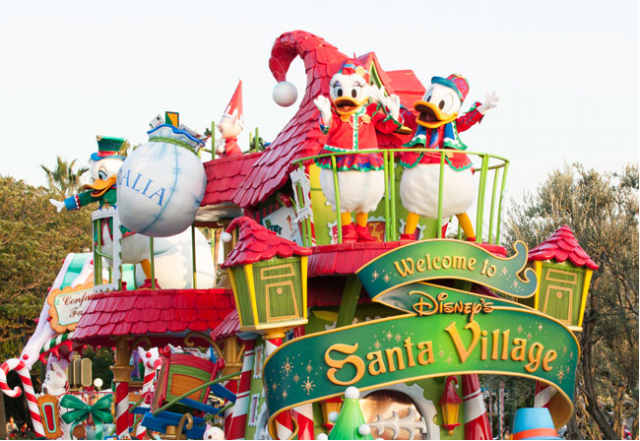 The Disney characters and the residents of Disney’s Santa Village will appear in the holiday parade. 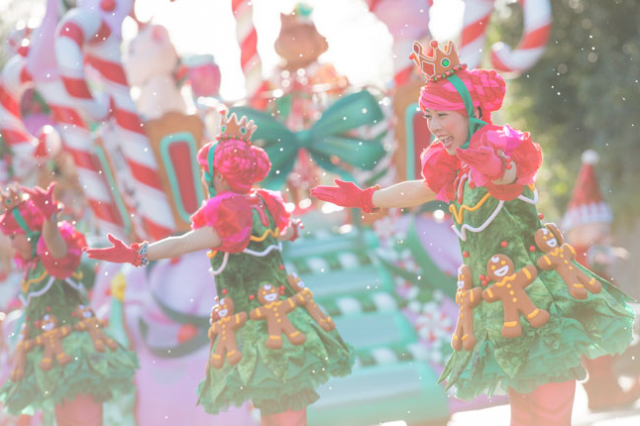 And throughout the Park, colorful decorations will add to the fantasy-filled atmosphere of Christmas. Everyone’s wishes are embodied in the Christmas trees of this heartwarming holiday event. 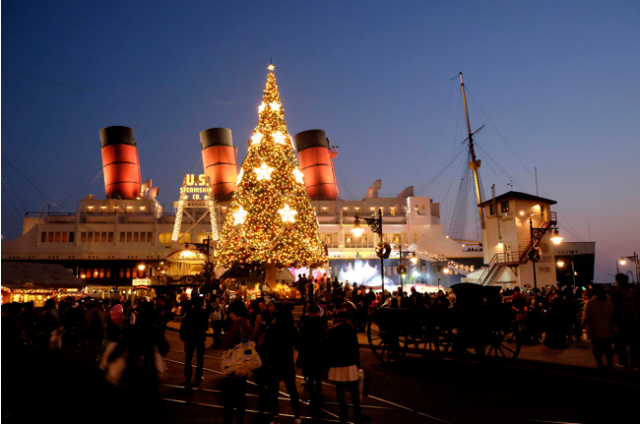 At each of the themed ports, Guests will find Christmas trees and other monuments put up by the Disney friends with the hope that their Christmas wishes will come true. 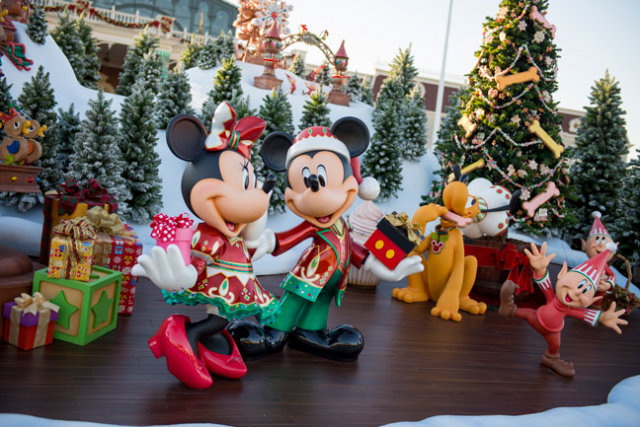 And after dark, a romantic entertainment will be presented in Mediterranean Harbor with a towering Christmas tree that sparkles mystically with the wishes of all the Guests. 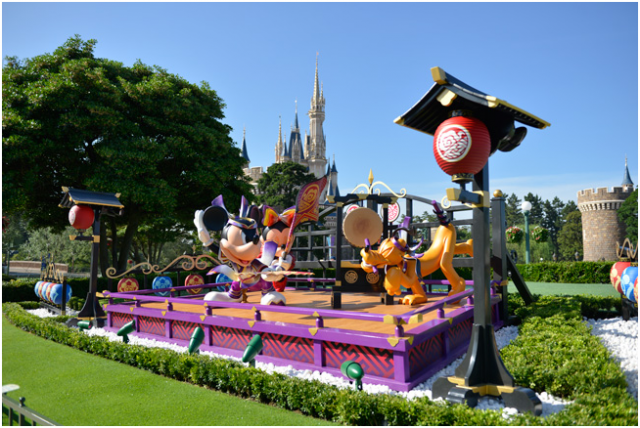 Both Parks will celebrate the start of the year with colorful Japanese-style New Year’s decorations at the entrances, merchandise featuring the zodiac animal for the year and traditional New Year’s cuisine. 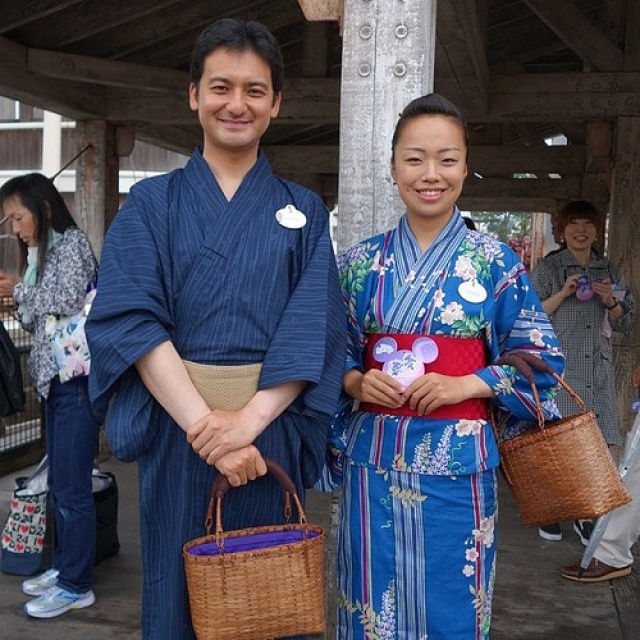 The Disney characters will be dressed up in kimono to welcome Guests. This fireworks spectacular, which premiered for the Tokyo Disney Resort 30th Anniversary, will continue to be presented (except for a certain period) after the anniversary celebration ends. 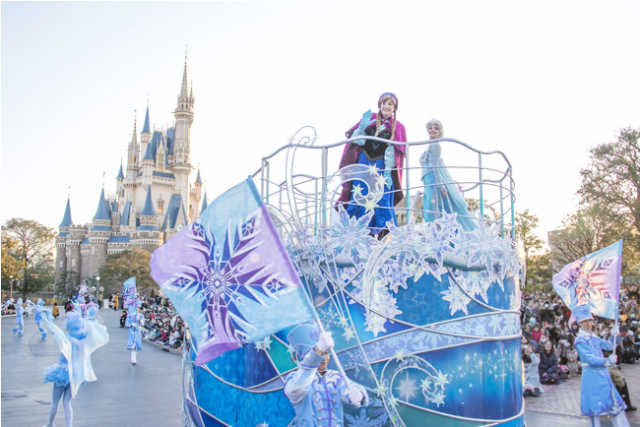 Le 25 mars dernier, Tokyo Disney Resort a présenté son programme pour les Disney Tanabata Days ou Star Festival qui succédera à la saison du printemps qui se termine le 23 juin 2014. Depuis 1997, ce festival qui dure deux semaines fait partie du programme de Tokyo Disneyland et, pour la première fois cette année, s'invite également à Tokyo DisneySea. 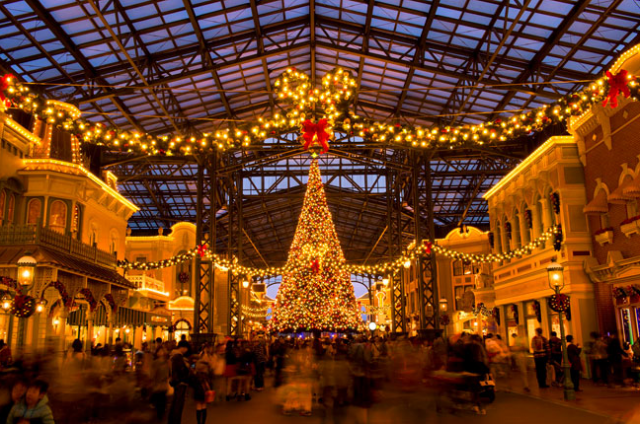 Photo d'illustration : Tokyo Disney Resort. Un show d'une dizaine de minutes, Tabanata Greeting, sera présenté trois fois par jour à Mediterranean Harbor. Mickey Mouse, Minnie Mouse, Donald Duck, Daisy Duck, Duffy et Shelly Mae y participeront. A Tokyo Disneyland, Tabanata Greeting se présentera sous forme d'une parade qui se produira deux fois par jour et durera environ 25 minutes. 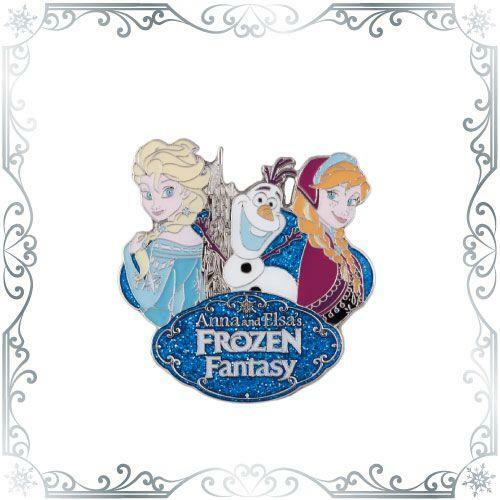 Comme chaque année, un merchandising spécifique sera disponible à Tokyo Disneyland mais aussi, cette année, à Tokyo DisneySea. Un menu spécial "Tabanata" sera proposé au restaurant Sakura à Tokyo DisneySea et au restaurant Hokusai à Tokyo Disneyland. 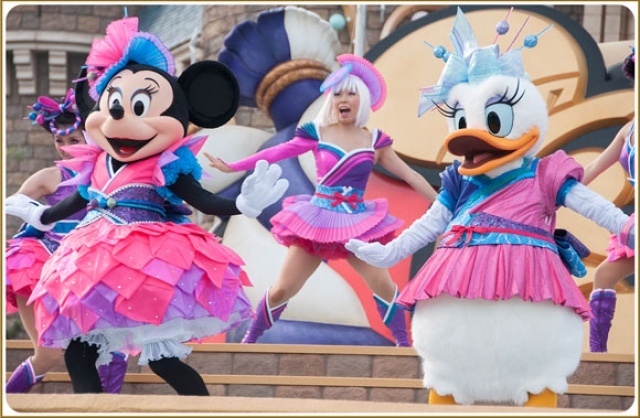 Alors que Tokyo Disney Resort fête actuellement Pâques et le printemps (pour les détails : http://www.disneycentralplaza.com/t40436-tokyo-disneyland-nouvelle-parade-hippiti-hoppiti-spring-time-du-2-avril-au-23-juin-2014 ), la saison d'été qui suivra les Disney Tanabata Days a été présentée le 8 avril dernier. 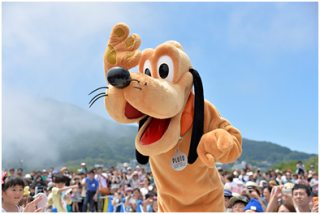 Le Disney Summer Festival débutera à Tokyo Disneyland et à Tokyo DisneySea le mardi 8 juillet pour se terminer le dimanche 31 août 2014. 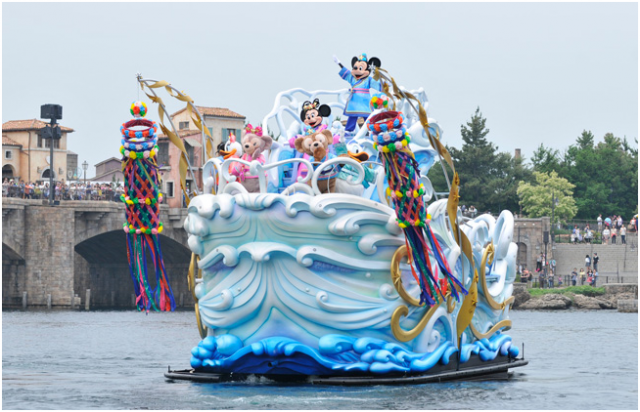 Tokyo DisneySea présentera deux spectacles d'une vingtaine de minutes : Tropical Splash of Minnie à Mediterranean Harbor (trois fois par jour avec Minnie Mouse et Daisy Duck mais aussi Mickey Mouse, Donald Duck et Clarice) et Atmosphere Show à Lost River Delta (cinq à six fois par jour l'après-midi). Tokyo Disneyland présentera trois fois par jour un spectacle d'une bonne douzaine de minutes devant le château de Cendrillon avec Mickey Mouse et Donald Duck (Ryo military MiyabiSayaka group dancing). Comme à chaque saison, décorations dans les parcs, merchandising spécifique dans les boutiques et menus spéciaux dans certains restaurants ne manqueront pas. 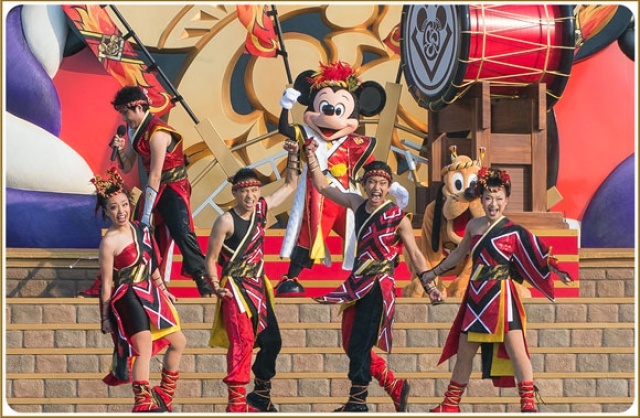 A noter que le spectacle aquatique Legend of Mythica sera présenté à Tokyo DisneySea pour la dernière fois le dimanche 7 septembre 2014. 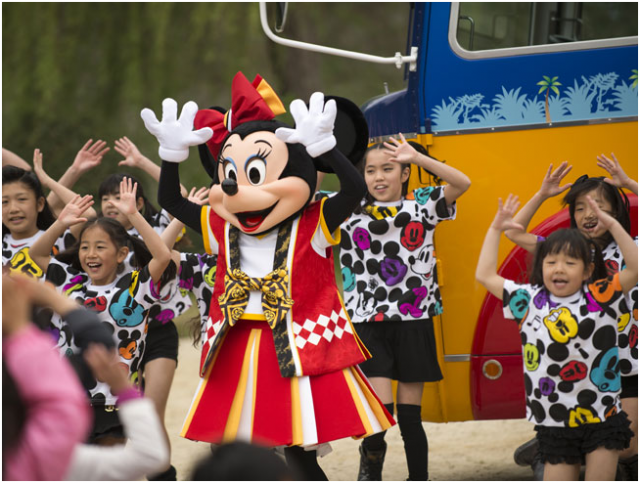 Après avoir assuré la promotion de la saison de Pâques et du printemps avec le bus Duffy, Tokyo Disney Resort a entamé cette semaine la promotion de la saison d'été, le Disney Summer Festival, dans le parc Meijo à Nagoya. Jusqu'au 22 juin prochain, Ondo Mickey Tour continuera sa tournée promotionnelle dans une dizaine de villes à travers le pays. Parmi les diverses animations qui se succèdent tout au long de l'année dans le resort japonais, on remarque que des activités prennent régulièrement place dans les trois hôtels Disney et leurs restaurants et salons respectifs. Des déjeuners (à 12h00) et des dîners (à 18h00) avec spectacle seront proposés durant l'été au Disney Ambassador Hotel. La durée du spectacle "Fantastic Reviews of Donald" est relativement courte (performance de 5 minutes avant le repas et de 15 minutes à la fin du repas). Le forfait déjeuner est vendu 14.500 ¥ et le forfait dîner 16.000 ¥. Le nombre de places étant limité, ces forfaits sont évidemment très rapidement vendus. Les guests ayant réservé et payé leur forfait se verront attribué leurs sièges dans la salle sur base d'un tirage au sort effectué une heure avant le début du déjeuner ou du dîner soit respectivement à 11h00 et à 17h00. Une photo souvenir est inclue dans le forfait. En effet, chaque participant aura l'occasion de passer par le Meet & Greet exclusif avant le début des repas càd à partir de 10h00 et à partir de 16h00 suivant le forfait choisi. La photo souvenir leur sera remise après le repas. 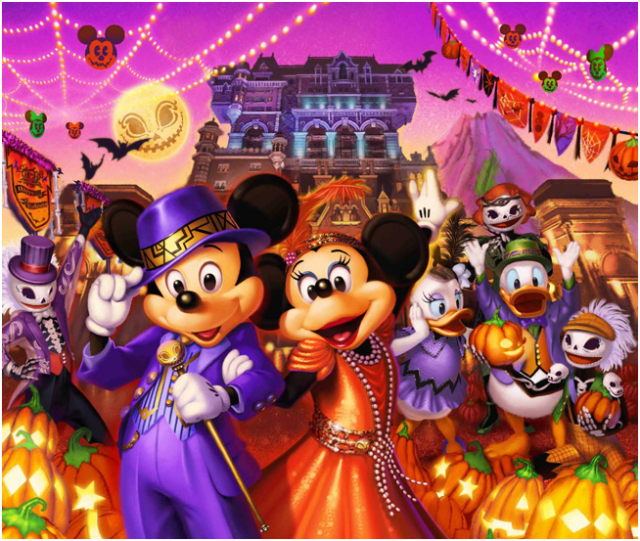 Halloween à Tokyo DisneySea (illustration : Tokyo Disney Resort). Tokyo Disney Resort a communiqué les premières informations concernant les célébrations d'automne : "Disney's Halloween". Cette année, Tokyo Disneyland et Tokyo DisneySea fêteront Halloween du lundi 8 septembre au vendredi 31 octobre avec décorations, musiques, animations, parades, spectacles, catering et merchandising spécifiques. 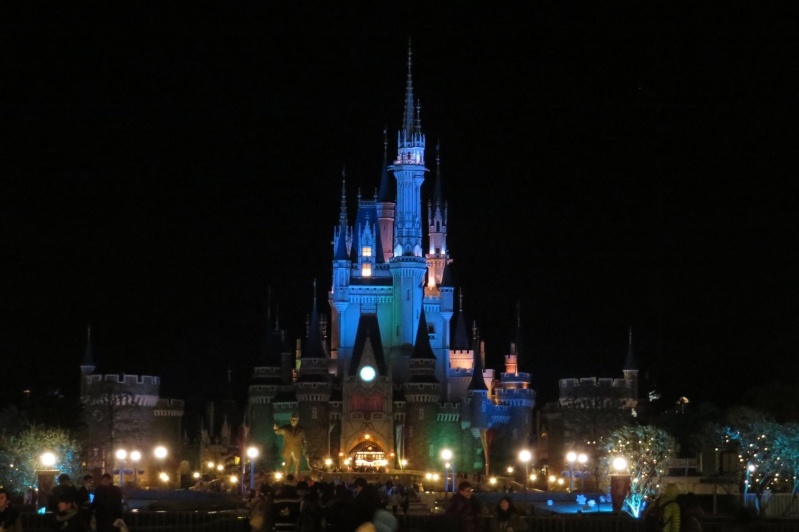 A Tokyo Disneyland, on retrouvera l'atmosphère d'Halloween dans chaque partie du parc, incluant attractions et restaurants, avec, en point d'orgue, la parade d'Halloween. A Tokyo DisneySea, les célébrations prendront place dans différentes zones du parc : The American Waterfront, Mediterranean Harbour et Lost River Delta. Les trois hôtels Disney et le monorail du resort participeront également aux célébrations avec une décoration appropriée. Des menus spéciaux seront proposés dans plusieurs restaurants des parcs et des trois établissements hôteliers Disney. Chaque parc disposera de sa propre collection de souvenirs estampillés "Halloween". 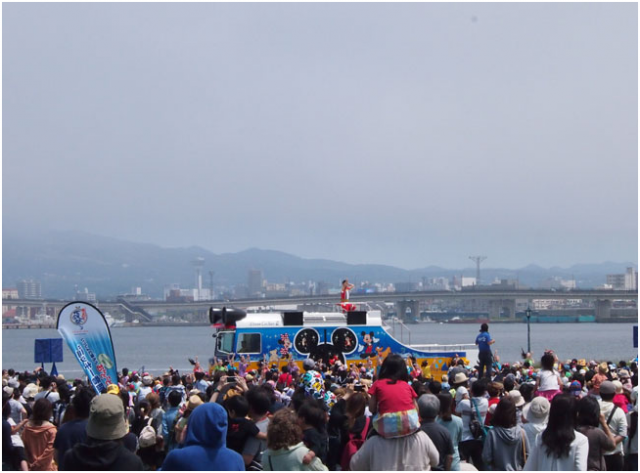 La tournée promotionnelle Ondo Mickey Tour entamée en avril dernier s'est terminée ce dimanche 22 juin sur l'île d'Hokkaido. La saison de Pâques et du Printemps se termine ce lundi, demain mardi débuteront à Tokyo Disneyland et Tokyo DisneySea les Disney Tanabata Days (ou Star Festival) jusqu'au 7 juillet prochain. On notera les costumes traditionnels portés par les cast members lors de ce festival qui se termine le 7 juillet. Dès demain, place au Disney's Summer Festival ! 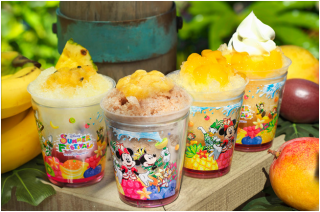 Disney's Summer Festival à Tokyo Disneyland (Photo: Tokyo Disney Resort). 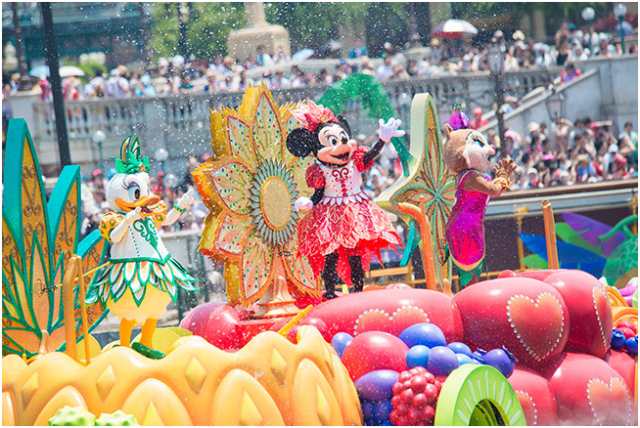 Disney's Summer Festival à Tokyo DisneySea (Photo: Tokyo Disney Resort). 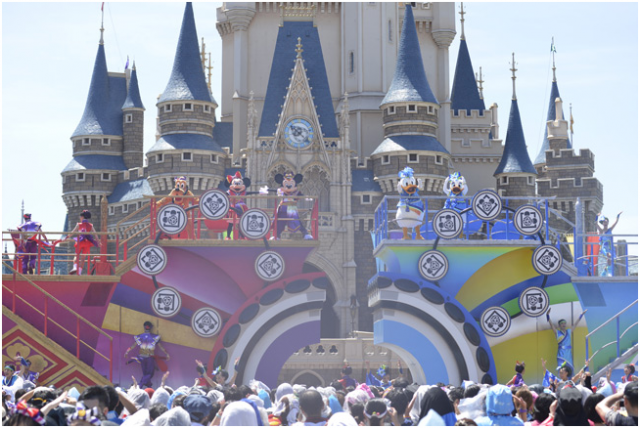 Disney's Summer Festival à Tokyo Disneyland (Photos: Tokyo Disney Resort). La saison d'été, Disney's Summer Festival, se termine dimanche prochain et dès le lundi 8 septembre débutera la saison d'Halloween : Disney's Halloween. A cette occasion, Tokyo Disney Resort invite 130 couples (ou paires) à participer dimanche prochain a un événement spécial au restaurant Yucatan Base Camp Grill de Tokyo DisneySea. Les 260 invités auront l'occasion de déguster en avant première les différents menus spéciaux qui seront proposés dans les restaurants des parcs pendant deux mois à partir du 1er septembre prochain. Les participants auront également l'occasion de découvrir les deux nouvelles collections de souvenirs sur le thème d'Halloween (Disney's Halloween Tokyo Disneyland et Disney's Halloween Tokyo DisneySea). 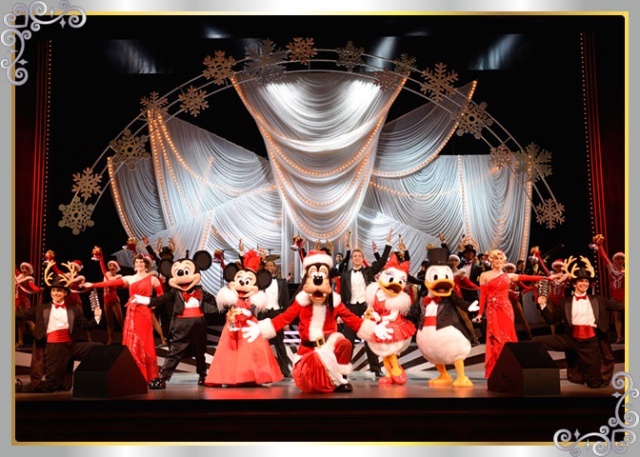 Le Broadway Music Theatre invite les visiteurs du parc Tokyo DisneySea à découvrir son spectacle musical de Noël aux notes jazzy. 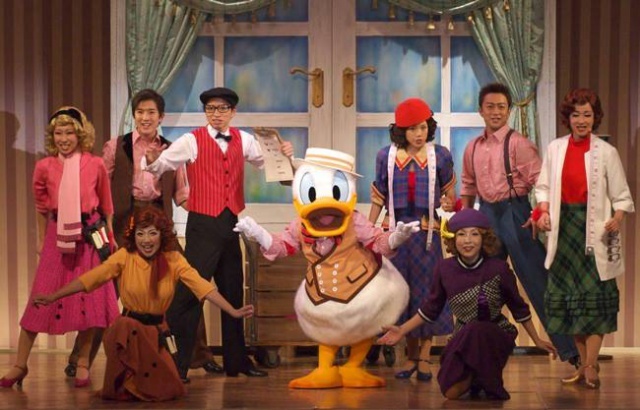 Ce spectacle de saison est présenté quotidiennement jusqu'au 25 décembre au théâtre de l'American Waterfront de Tokyo DisneySea. La saison Frozen Fantasy dure jusqu’à quand ? Cette année, du 13 janvier au 20 mars 2015. 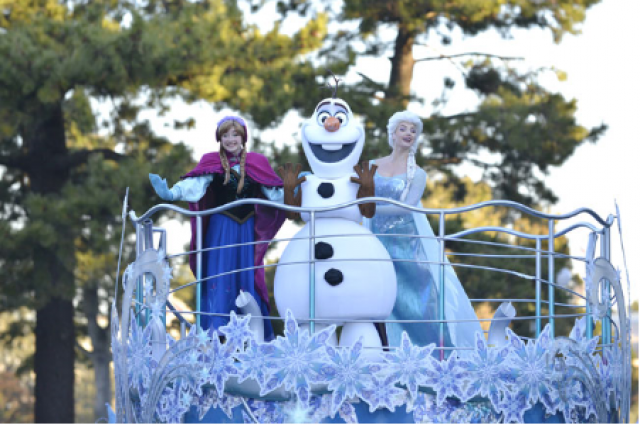 Et l'année prochaine la saison Anna & Elsa's Frozen Fantasy est programmée du 12 janvier au 18 mars 2016. Je ne sais pas si tu pourra me renseigner, mais il est vrai que ce pin's est juste dispo pendant cette période ? Voici une petite vidéo de la parade d'Anna et Elsa tournée lors de mon dernier séjour à Tokyo. 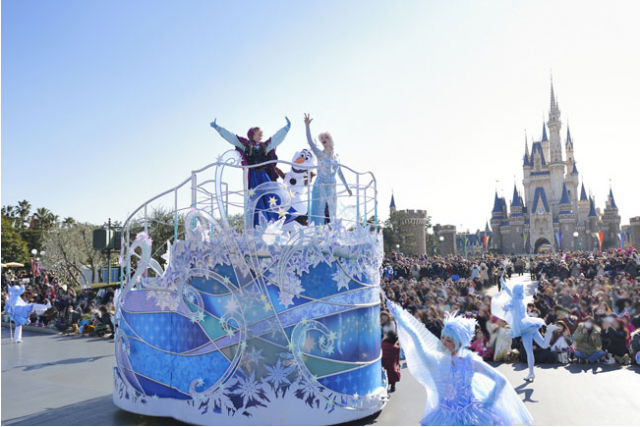 This regular springtime event is back again this year at Tokyo Disneyland. At the secret Easter garden, Guests can enjoy a whimsical atmosphere full of flowers and plants, where Mickey Mouse and his Disney friends along with the Easter bunnies take part in an “egg race.” Guests will be able to celebrate the springtime season in a colorful way in the main entertainment, a parade featuring Mickey Mouse, Minnie Mouse and the Disney friends wearing bunny ears and new costumes. In various places around the Park, Guests will find decorations, merchandise themed to the “egg race.” Also, the popular “Egg Hunt” program can be enjoyed again this year. 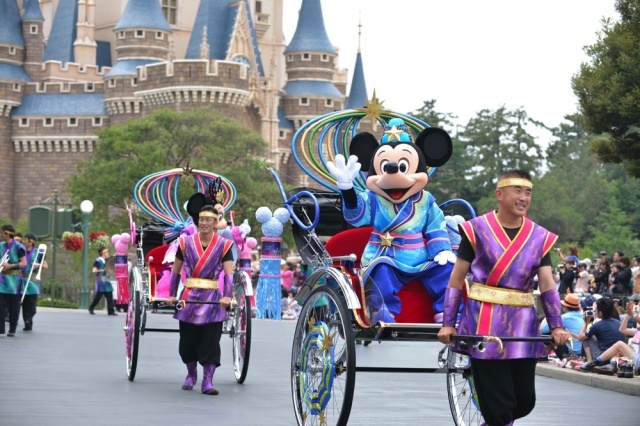 The Japanese star festival known as “Tanabata” will be celebrated with a special program in a manner unique to the Disney theme parks. 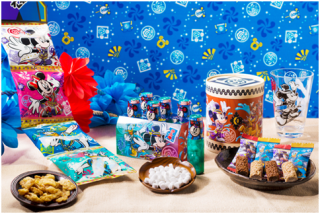 Offered from June 16, which is eight days earlier than it started last year, “Disney Tanabata Days” will feature traditional decorations in World Bazaar. Guests can write their wishes on “Wishing Cards” to be hung from the grand centerpiece. 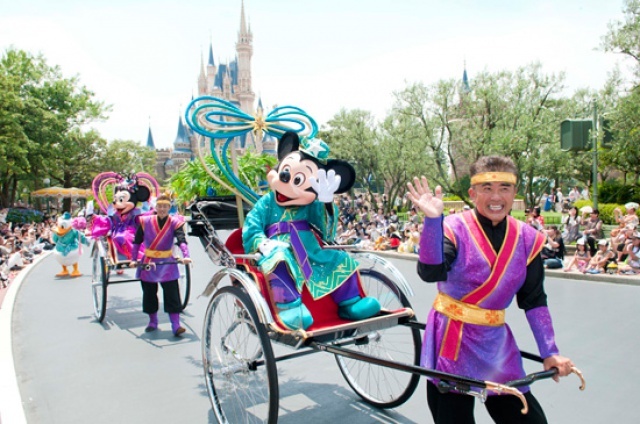 Mickey Mouse and Minnie Mouse, dressed as Hikoboshi and Orihime, the two star-crossed lovers of this festival, will greet Guests along the parade route. 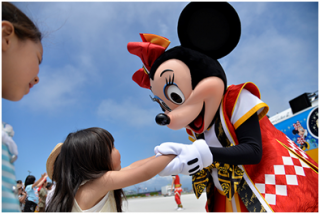 Natsu matsuri means “summer festival” in Japanese and Guests will be able to enjoy the hot summer with the Disney characters in this energizing special event. In the show presented at the Plaza in front of Cinderella Castle, everyone will get soaking wet as they enjoy the group dancing and the summertime heat. 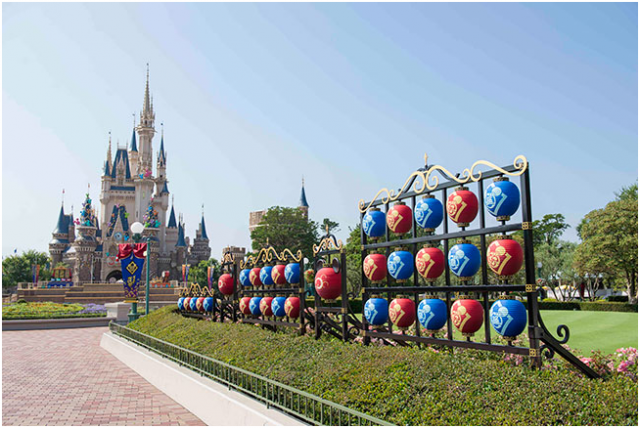 Guests can find Japanese banners as well as photo locations that enhance the festive atmosphere even more. The special event, “Disney’s Halloween,” will take place with a new theme featuring the Disney characters and mischievous ghosts. 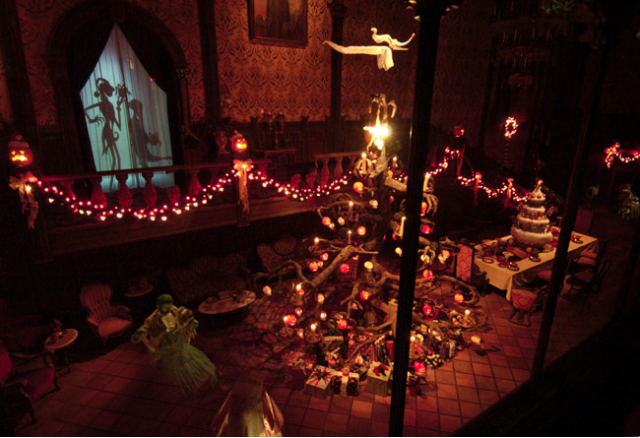 Guests can join the Halloween ghosts and the Disney characters in an exciting Halloween. 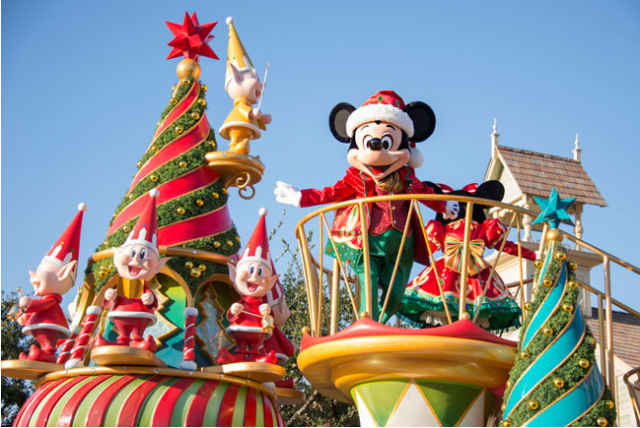 Guests will be able to enjoy the special event “Christmas Fantasy” with the theme of “Christmas Storybooks.” Guests will find happy Christmas scenes with their favorite Disney characters that have come right out of a storybook world. 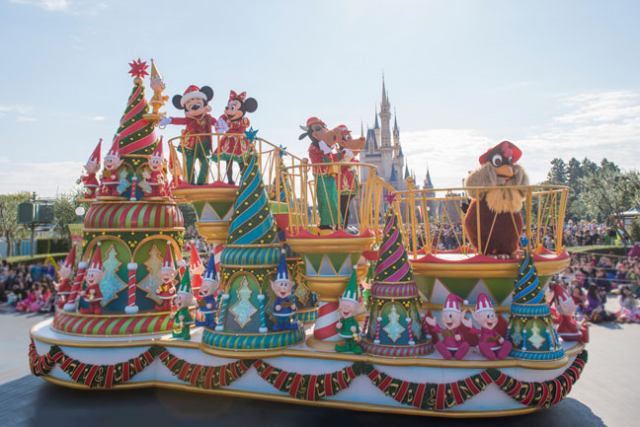 The main parade will bring to life pages from storybooks showing the Disney characters having fun at Christmastime. 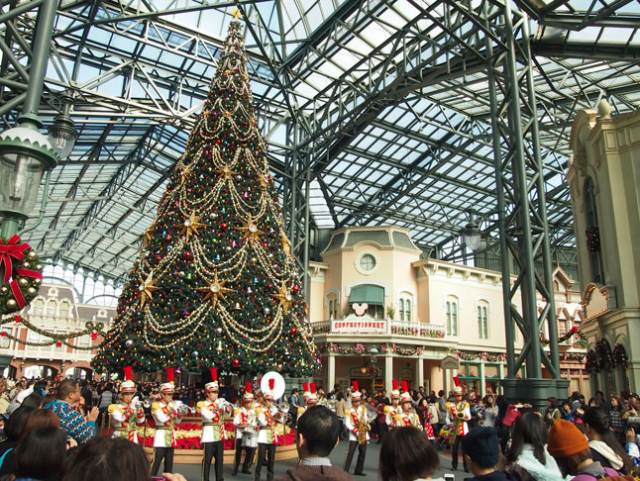 Guests will find a 15-meter-tall Christmas tree at the center of World Bazaar, as well as holiday photo locations, garlands and other decorations in each themed land. A brand new facility for Disney character greetings and a new restaurant will be built in Westernland. These facilities will be themed to the world of the “Junior Woodchucks” series as shown in Disney comics and animated short films. 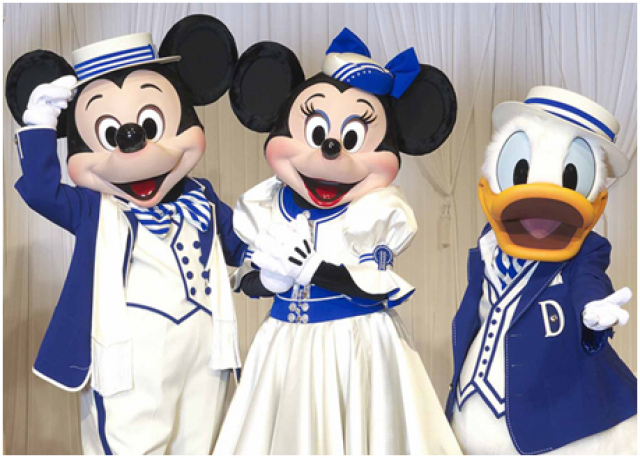 The new Disney character greeting facility will be the second dedicated greeting facility to open at Tokyo Disneyland since Mickey’s House and Meet Mickey opened about 20 years ago in 1996. The new restaurant will be located in a new two-story facility with an indoor dining area on the second floor and an outdoor dining area with a campfire setting. Guests will be able to relax and enjoy a meal while taking in the scenery of the Rivers of America. The Park will celebrate the start of the year with colorful Japanese-style New Year’s decorations at the entrance, as well as merchandise and menus featuring the 2017 zodiac animal, the rooster. 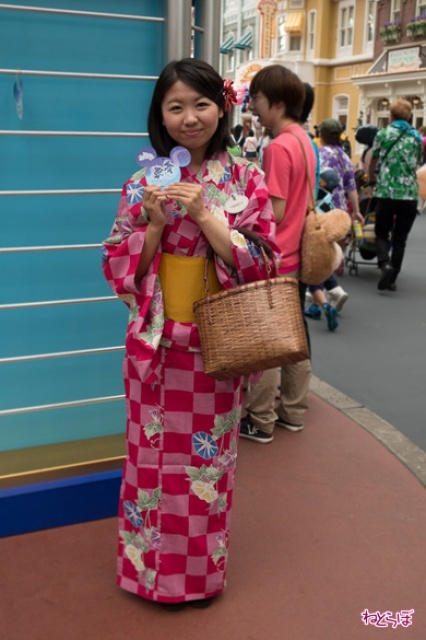 The Disney characters will be dressed up in kimono to welcome Guests in Japanese style. This popular show presented at the Broadway Music Theatre in American Waterfront features swing jazz, which was the dominant form of popular music from the 1920s through the 1940s. “Big Band Beat” will debut in a new version, with new music, costumes and scenes. This will be the first time that the show has been changed since it opened in July 2006. 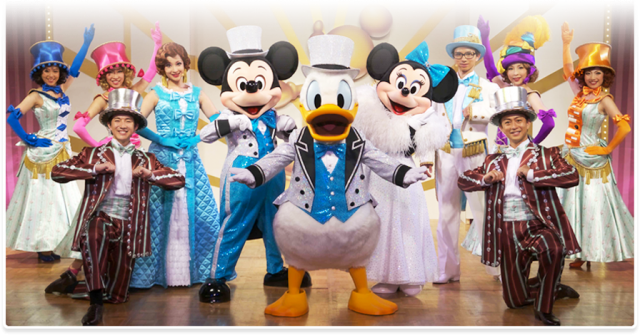 This revue with swing jazz by a live big band will continue to dazzle with stunning vocals, energetic tap dancing and the climactic drum performance by Mickey Mouse. 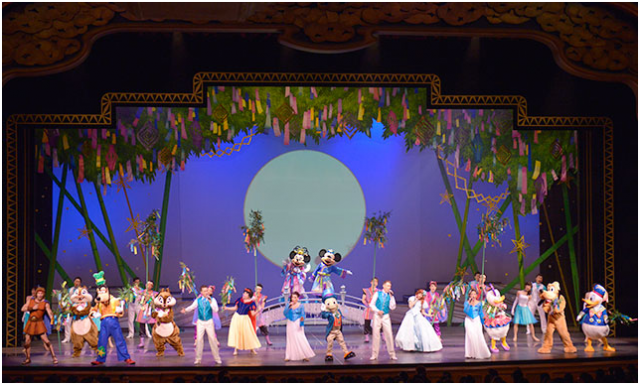 New scenes such as a jazz number with Goofy dancing and singing, as well as Mickey Mouse and Minnie Mouse in new costumes performing a rhythmical dance, will enhance the appeal even further. Broadway Music Theatre is presented by Japan Airlines Co., Ltd.
Based on an original story by Disney expressly for the Hangar Stage in Lost River Delta, this brand new musical show is brought to life through colorful images and powerful live performances. “Out of Shadowland” tells the story of Mei, a timid young girl lost in a world of shadows who finds confidence and strength through her sojourn there. Mei has lost her way and finds herself in Shadowland where the evil Kagetori has taken control. She meets a boy named Yu who leads her to discover within herself a mysterious power that she was unaware of. Mei’s power brings light and life back to Shadowland. Fighting against her own fear and insecurity, Mei is able to bring down Kagetori. At the end she realizes that Yu and Shadowland have helped her gain the confidence she now feels. Through the moving live performances, vivid images and other elements that create colorful, dynamic scenes, Guests will experience a world unlike any seen before. Hangar Stage is hosted by Bridgestone Corporation. The Japanese star festival known as “Tanabata” will be celebrated with a special program in a manner unique to the Disney theme parks in Japan from June 16, which is eight days earlier than last year. 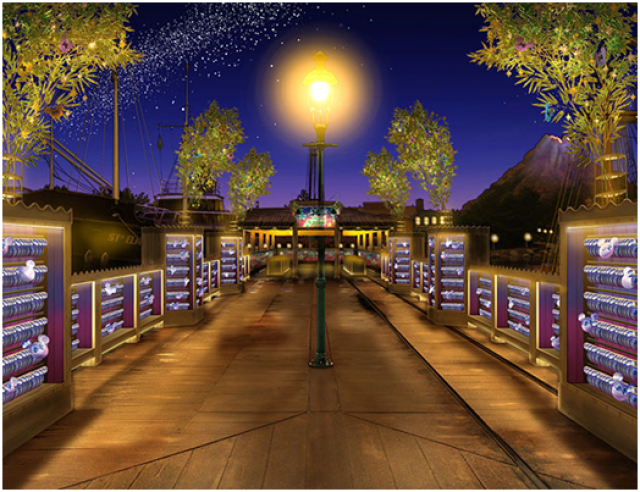 “Disney Tanabata Days” will feature traditional Tanabata decorations in the New York area of American Waterfront where Guests can write their hopes and wishes on Wishing Cards and tie them onto the Wishing Place, which will be set up for this occasion. 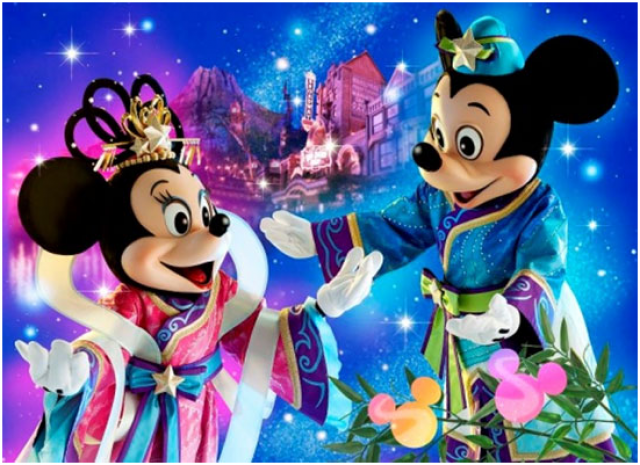 In Mediterranean Harbor, Mickey Mouse and Minnie Mouse will appear in a greeting show dressed as Hikoboshi and Orihime, the festival’s two star-crossed lovers. In addition, special menus themed to Tanabata will be offered. 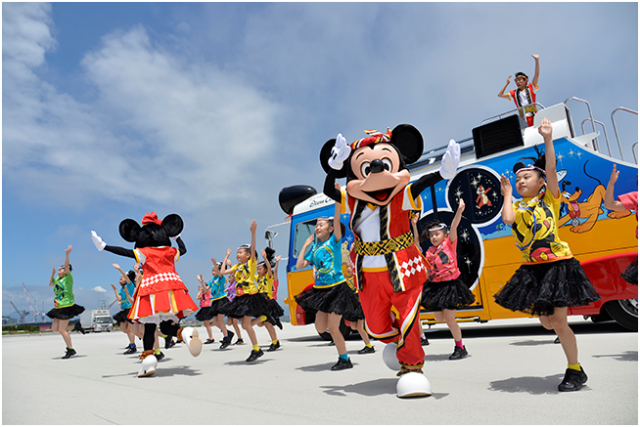 This summertime festival of tropical fruit and Latin rhythms will be presented with the main venue of Mediterranean Harbor wrapped in a celebratory mood for the 15th anniversary. 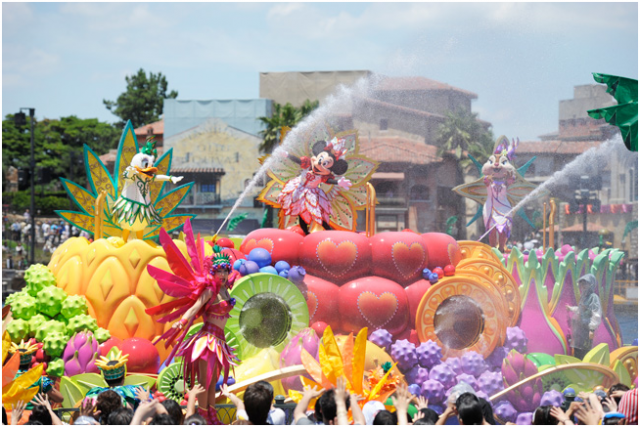 While volumes of water spray around the area, everyone can join the Disney characters in singing and dancing to the rhythmical music of the tropical summer carnival led by Minnie Mouse. 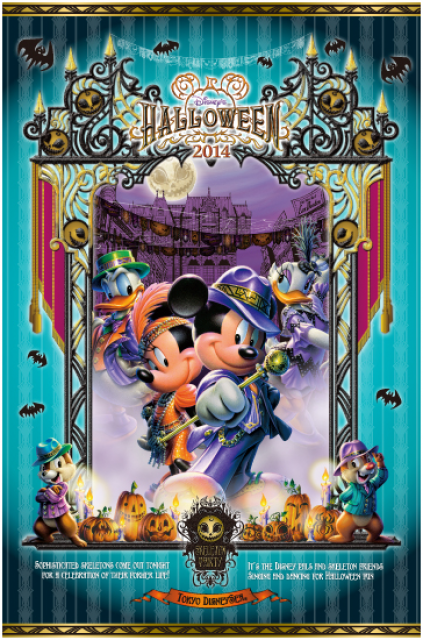 This 15th anniversary year, Tokyo DisneySea will offer a “cool” but ominous Halloween with the Disney villains. 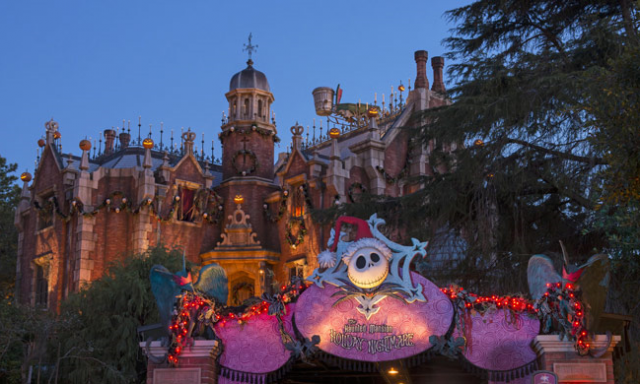 The Park will be transfigured into an eerie, other-worldly place where Mickey Mouse and his Disney friends along with the villains put on a gorgeous and stylish Halloween. Guests can enjoy a show on the waters of Mediterranean Harbor that creates a frightfully cool Halloween from the world of the villains. 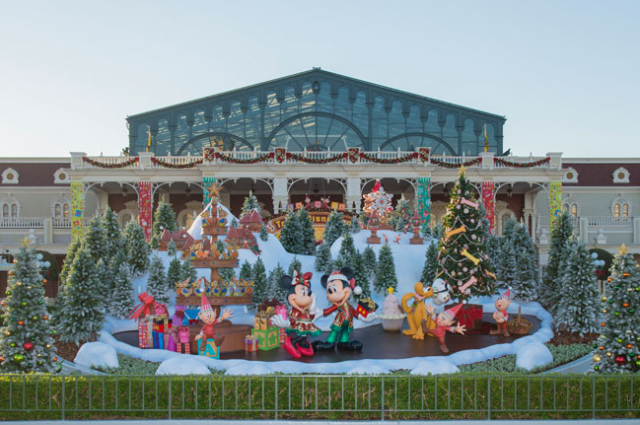 In each of the themed ports, Christmas trees and other monuments put up by the Disney friends with their Christmas wishes will create a heartwarming and romantic atmosphere in the Park. 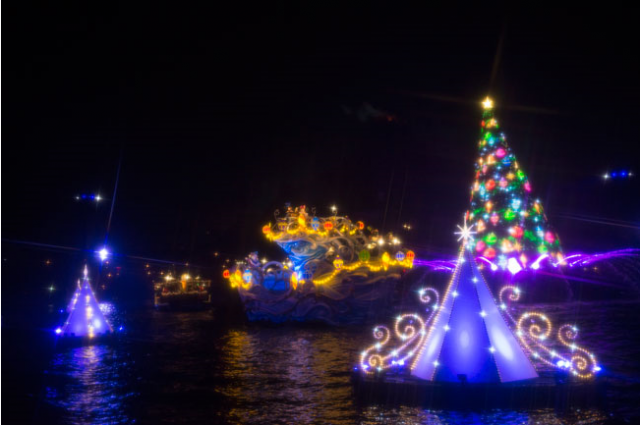 Besides a daytime show presented at Mediterranean Harbor, a nighttime show will feature colorful Christmas trees for the 15th anniversary on the waters of Mediterranean Harbor creating a fantastic atmosphere. 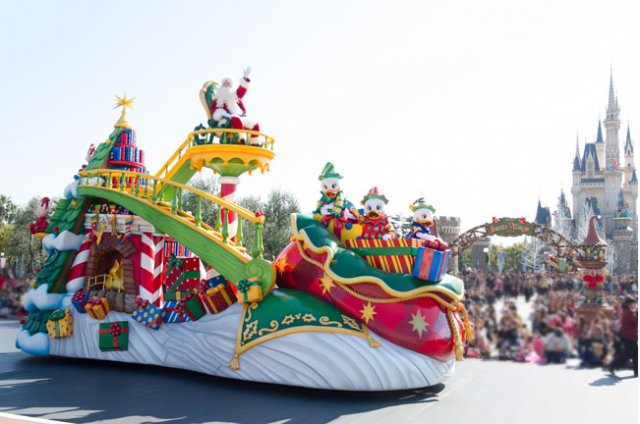 Guests are sure to enjoy a Christmas event full of variety. The Park will celebrate the start of the year with colorful Japanese-style New Year’s decorations at the entrance and merchandise featuring roosters, the zodiac animal for 2017. 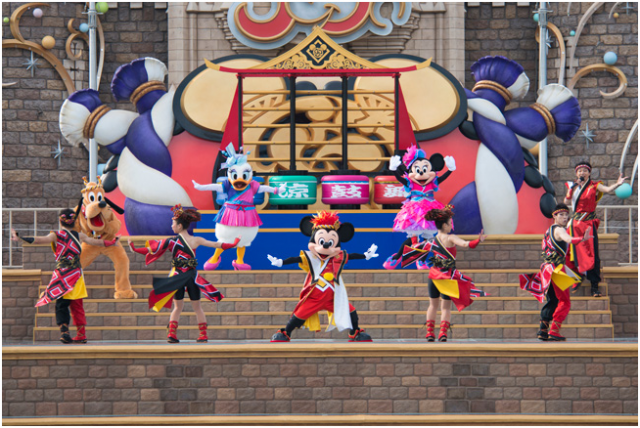 The Disney characters will be dressed up in kimono to welcome Guests in Japanese style and special New Year’s menus will be offered.